Our friend, Cathy, was in town on vacation and we went to dinner with her tonight. She's staying at her mom's house so we met her there. It was very nice to see her mom again. We also met Cathy's two sons, Sean and Brendon. When Cathy told her oldest son, Sean, that she and I met when we were his age, he said something like "Wow, 33 years ago." Out of the mouth of babes! We ate dinner at Bottleworks. We had a great time catching up on current happenings in our lives as well as musing about the various trials and tribulations of life after 40...gray hair, arthritis and bifocals...hee hee hee. So far, I have managed to escape two out of three of these aflictions. White Christmas was this week's performance. It is an original Muny production that premiered in 2000. We did not have season tickets that year (I can't remember for sure, but I think it was due to the fact that there were a lot of "repeats" that year). Anyway, it was a great performance. I especially loved the tap dancing numbers. It was the story of two Army buddies who form a song and dance team after World War II. They meet singing sisters and fall in love, of course. They head to Vermont to perform at a ski lodge and find that the owner is their former General. The foursome decide to put on a show to help the financially strapped General. All ends well, and it turns out to be a White Christmas. At the end of the show during the performance of the title song. the backdrop opened to reveal 4 lighted Christmas trees with snow gently falling from above. More snow then started falling from the lighting grid above the stage. It actually looked like snow! It made you forget that it was a hot July evening! Once again I used one of my favorite new sets, Polka-Dot Posies. I'm really glad I bought this set. I used the new Speckled wheel for the background and added glitter to the center of the flower. There are over 80,000 members on Splitcoast Stampers so naturally, it would be impossible to "meet" everyone. The RAK group gives us an opportunity to get to know some of the members as well as put our card-making skills to good use! I continued working on our 2006 Christmas cards tonight. I started the design back in February and since then, I've been measuring, cutting, stamping, embossing and embellishing. I only work on them for a brief time every few weeks. I don't have the patience to produce the same card over and over and over in a short period of time, hence the reason for starting on them in February...hee hee hee. No, not the Fleetwood Mac song, which happens to be one of my favorites, by the way. We saw the musical Gypsy at the Muny last night. We had never seen it before and we both really enjoyed it. It's the story of Gypsy Rose Lee, a burlesque dancer. Actually, the story is more about her mother, Rose. She's the ultimate "stage mother" so to speak. Although there are a few sad parts, particularly towards the end, there was no crying from the surrounding audience members. Thank goodness...hee hee hee. There were three songs in particular that I knew but didn't realize that they came from this musical...Let Me Entertain You, Everything's Coming Up Roses and Together Wherever We Go. This last song reminds me of the Brady Bunch episode where Carol and Marcia perform this song in a talent show. Luckily the weather cooperated. It had been pretty warm and humid all day and another strong storm had moved through at about 10:30am but it only managed to cool the temperatures slightly. While we were eating dinner, again at the Culver Pavilion, it rained quite heavily. The temperature dropped and it was actually a little chilly during the performance. I'm not complaining, though. At least it wasn't 100 degrees. The performance went on as scheduled and we felt only a few drops of rain throughout the evening. A very strong storm moved through the area about 3 hours ago. One minute it was 99 degrees and sunny (we hit a high of 100 today) and about 20 minutes later, it was extremely windy, rainy and 74 degrees. The Cards/Braves game was just about to start when the ground crew had to put the tarp on the infield. It was so windy that it tore the tarp and home plate was flooded with about 3 inches of water. The free-standing concession stands were blowing over and people were scurrying for cover. The windows in the press box were blown in. No injuries were reported. The storm moved from north to south which is quite unusual. Apparently when this happens, the storm tends to be very strong. We were without power for just a brief time (about 2 minutes), however, my parents are still without power. The storm was especially strong in their area, knocking over trees and downing power lines. This storm doesn't signal an end to the heat wave, however. They are predicting a high of 102 degrees tomorrow with more storms moving in tomorrow night and early Friday. These storms are the ones that are supposed to bring an end to this heat. The baseball game finally started over 2 hours late. Hopefully the Cards can get back on track after the last two disastrous games. My nephew, Gecko Dude, turned 12 today. I can't believe he'll start 6th grade in the fall. I told him that Bill and I met in 6th grade and he chuckled and wrinkled his nose. His birthday party was Saturday evening. We ate dinner and then he opened his presents. He loves cheesecake so, instead of a traditional birthday cake, we had cheesecake and strawberries. Good choice! I love summer...the hotter the better. On one of our trips to Vegas a few years ago, the high was 114 but the humidity was only 10%. There really is a difference between dry heat and humid heat. The high today was 98 but the humidity was lower than normal so it didn't really seem too bad. It's supposed to get even hotter this week (100 or more) but that's fine with me. I'll never complain about the heat. Cold and snow, on the other hand, are a different story. I designed a couple of new cards this weekend and I'll upload them soon. The Cards won the game last night, 5 to 0. It was a great game with several home runs! The temperature was fairly warm but not unbearable. The open design of the stadium allows the breeze to come through, something that was not possible in the old stadium. I have been a Dodger fan since 1976. I originally started following the Dodgers because Toni Tennille sang the National Anthem at a lot of the games. I instantly became hooked though, mainly due to the enthusiasm of the manager, Tommy Lasorda. Tommy never held in his emotions and he was always so into the game. Tony LaRussa could take a few lessons from Tommy in that area in my opinion. To this day, I'd really have to say that Tommy is my all-time favorite manager. Anyway, I miss the Dodgers of the late 70's and early 80's; Ron Cey, Steve Garvey, Davey Lopes, Bill Russell, Dusty Baker, Rick Monday, Steve Yeager, Fernando Valenzuela. My favorite was Ron Cey, aka The Penguin. When the Dodgers and Cardinals were playing in the National League playoffs in 1985, we had tickets for one of the games. I went with my dad, sister and Bill. They made me promise not to wear my Dodger jersey or cap so I dutifully wore my Cardinal shirt and cap and cheered loudly for the Cardinals. In about the fifth inning, however, I raised the leg of my jeans to reveal my Dodger socks. Hey, I promised not to wear my jersey or cap but I never said anything about my socks...hee hee hee. By the way, the Cards won the game 4 to 3 and the series was then 2 to 1 Dodgers. The Cards went on to win the National League pennant but they lost to the Royals in seven games. I was finally able to see a game at Dodger Stadium last October when we were on vacation. It's a great stadium. The one thing that I find really funny though is the fact that a large number of fans don't even show up until the third inning. I guess that's the laid-back California style...hee hee hee. We actually didn't arrive until the second inning. I won't go into details but I'll just say that Mapquest isn't always accurate and the parking at the stadium is very confusing. We'll know better next time! This is the flower from the Sketch It set. I stamped the flower with Summer Sun and then inked a solid square stamp with Pumpkin Pie and touched the inner and outer edges of the flower before stampin it on white card stock. I then cut out the stamped image. I punched 1/8" circles out of Chocolate Chip card stock and glued them to the inside of the flower to replicate sunflower seeds. 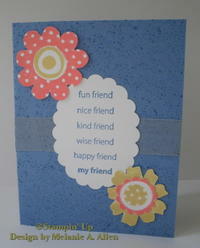 I sprinkled Dazzling Diamonds in the middle of the flower because no card is complete without glitter...hee hee hee. 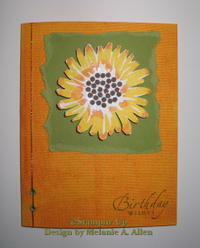 I used Summer Sun card stock for the base and stamped it with the Linen background inked with Pumpkin Pie. The sunflower is mounted on Old Olive card stock using Stampin Dimensionals which allow the image to be raised slightly rather than sitting flush on the card. Old Olive eyelets and gold cord complete the creation. I sent this card to a friend and frequent blog visitor whose birthday was yesterday. Hopefully she has received it by now. Happy Birthday, Cathy! 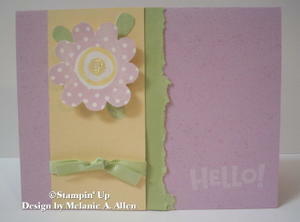 This card was made using one of my newest sets, Polka-Dot Posies. I think the polka dots make the images so whimsical. I used Cameo Coral and So Saffron for the flowers and Brocade Blue for the base. Glitter was applied to the center of the flowers and the background was created using my new Speckled wheel. I cut out the words with a scallop punch by Marvy Uchida and then added silver organdy ribbon. The Amuse-A-Palooza open house last night was a lot of fun. I went with my sister and we spent a little over an hour looking at all of the fun new images. They didn't have my polka dot alphabet that I so desperately want so they are going to order it for me. I did buy one flower stamp that coordinates with my Polka-Dot Posies set as well as a little martini glass, 2 phrase stamps, and a grass stamp (I've been wanting this one since I first saw it...so cute when stamped at the bottom of a card with flowers added, of course). Afterward, we ate at Elephant Bar. Crispy Teriyaki Chicken... Yum-0. I took a vacation day today. It's been great having the day off . We're going to the Cards/Dodgers game tonight. I love the Dodgers but of course, I'll be rooting for the Cardinals.